Alabama, the "Heart of Dixie"*, plays out the future against a rich historic background, from Cheaha Mountain (2,407 feet) to the East Gulf Coastal Plain and the swamps and bayous of the Mobile River Delta. From the land of the Cherokee, Creek, Choctaw, and Chickasaw Indians, the Spanish, the French and the English pioneers to the unknown reaches of the Space Age, the Blue Gulf Waters reflect the venerable historic plantations, pine-ringed lakes, and echoes from the mountain tops amplified in mammoth caverns. The Confederate Constitution was formulated in Alabama along with the Saturn rocket that boosted the first men to the moon in 1969. The boll weevils came to the Black Belt in 1910 and tore into the cotton crop. And, the peanut, with a little help from scientist George Washington Carver's "300 new uses", became a very important crop. The state of Alabama was named after the river. The Alabama River was named by early European explorers after the Indian tribe that lived in the territory and first appeared in 1540 spelled as "Alibamu", "Alibamo" and even "Limamu" in the journals of the Spanish explorer Hernando DeSoto (c.1500-1542). The origin of the name Alabama is thought to come from a combination of two Choctaw words; Alba and Amo. In Choctaw, "Alba" means vegetation, herbs, plants and "Amo" means gatherer or picker. "Vegetation gatherers" would be an apt description for the Alabama Indians who cleared much land for agricultural purposes. Alabama has no official state nickname, but "The Heart of Dixie" is prevelant and reflects the central role that Alabama played in the history of the South. A major Cotton State, Alabama also became a leading proponent of secession in the days leading up to the Civil War. The Constitution of the Confederacy was drawn up in Montgomery and Jefferson Davis took his oath of office in Montgomery, which served as the first Confederate Capital. "The Heart of Dixie" was a phrase developed in the 1940s and 1950s by the Alabama Chamber of Commerce. Alabama was commonly referred to as the "Cotton State" but so were many other southern states. The Chamber sought a more distinctive slogan for their state and promoted that "Alabama is geographically the Heart of Dixie, Alabama is industrially the Heart of Dixie, Alabama is, in fact, the Heart of Dixie." In 1951, with backing from the Alabama Chamber of Commerce, the Alabama Legislature passed a bill to add "Heart of Dixie" to automobile license plates. In 1955, the first license plate bearing the new slogan was produced. Susequent standard-issue license plates have been adorned with slogans such as "Stars Fell on Alabama" and, as of 2009, "Sweet Home Alabama." This nickname originated during the Civil War. A couple of suggestions as to the origination of the nickname have been presented. One suggestion states that the name was inspired by the gray uniforms of Confederate soldiers that had a yellow tinge to them because they were "home-dyed." Another states that a company of soldiers paraded in uniforms that were trimmed with yellow cloth. Either way, the Alabama soldiers reminded people of Yellowhammers, birds with yellow patches under their wings. The Yellowhammer is Alabama's State Bird. Cotton production in Alabama was a major influence in the growth and culture of the state. In fact, Alabama'a farm economy was ruled by "King Cotton" at one time. When crops were poor or prices were down, Alabama farmers suffered. Conversely, when prices were up, Alabama's farmer prospered. In the early 1900s, Alabama farmers suffered extensively due to massive cotton crop failures. For reasons given above, Alabama was called the Cotton State. While many southern states were referred to as Cotton Plantation States, Alabama was singled out as THE Cotton State because of its central location in the Cotton Belt. Cotton was Alabama's leading crop and Alabama was considered a leading cotton producer. Alabama ranked 11th for cotton cash receipts in 2004. An abundance of lizards along Alabama streams, in early times, led to this nickname. 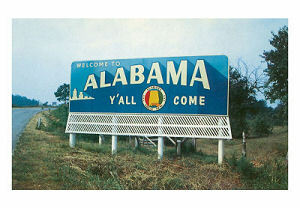 People who live in Alabama or who come from Alabama are called Alabamans or Alabamians. The Alabama State Quarter is the 22nd quarter released in the U.S. Mint's 50 State Quarters Program and the second to be released in 2003, following on the heels of the Illinois State Quarter. Alabama was admitted to the Union as the 22nd state on December 14, 1819. The quarter features a likeness of Helen Keller that was selected by great-great-niece, Keller Johnson-Thompson and other family members. She is seated, reading a book in Braille. The slogan, "Spirit of Courage" is displayed on a banner below Helen Keller's image. Her name is reproduced in Braille. Helen Keller is framed by Southern Longleaf Pine branches (State tree) and Camellias (State flower). 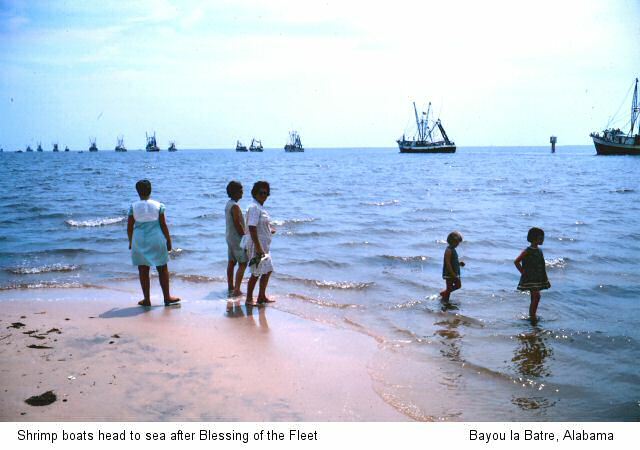 Off the Beaten Path: Alabama , by Gay N. Martin. 208 pages. GPP Travel; 8th edition (December 1, 2006) Led by this guide, locals and visitors alike will discover offbeat attractions such as the Old Monroe Courthouse, historic Heritage Park, the Boll Weevil Monument, and the Slick Lizard Smokehouse. Discover a different side of the Yellowhammer State. Stand in the spot where the "Mother of the Civil Rights Movement" was arrested and where the Montgomery bus boycott began. Shop for butter churns and collie puppies at one of the South's oldest and largest "trade days." Or cheer on your favorite footless friend in the world's only rattlesnake race. So if you've "been there, done that" one too many times, get off the main road and venture Off the Beaten Path. Y Is For Yellowhammer: An Alabama Alphabet , by Carol Crane. 40 pages. Sleeping Bear Press; 1 edition (September 30, 2003) Reading level: Ages 4-8. Travel across the diverse state of Alabama and meet its famous sons and daughters, from legendary football coach Bear Bryant to the remarkable Helen Keller and the civil rights activist Rosa Parks. Visit landmarks such as the Bellingrath Home, or stop by Landmark Park and see how a farm was run in the 1890s. Written in the popular two-tier format for the Discover America State by State series, with simple rhymes for younger children and expository text for older children. "Y is for Yellowhammer" is a delightful tour of the state of Alabama. Alabama , by Michael A. Martin. 48 pages. Gareth Stevens Publishing (July 2002) Reading level: Ages 4-8. Filled with the most up-to-date information, including the latest Census results. Full-color photos bring to life the story of Alabama. In addition to an in-depth factual profile of Alabama in the form of a state Almanac, this book offers fascinating and lively discussions of the state's history, people, geography, government, economy, culture, and lifestyles. A section on Notable People, a calendar of events, and enough primary source documents, time lines, maps, and other tools to make this unquestionably the best young adult reference material on the USA available anywhere. Alabama Stitch Book , by Natalie Chanin. 176 pages. STC Craft/A Melanie Falick Book (March 1, 2008) "Haute homespun out of the Deep South." That's how Vogue magazine has described the fashion of Natalie Chanin. Alabama Stitch Book brings us a collection of projects and stories from her clothing and lifestyle company, Alabama Chanin, known for the cutting-edge twist it puts on tried-and-true sewing, quilting, and embroidery techniques, applied mostly by hand to recycled cotton jersey. This long-awaited book from Chanin begins with her story. After living in New York and Vienna for over 20 years, she began to transform cotton T-shirts into high fashion using the needlework skills she learned as a child in Florence, Alabama. When she moved home, Chanin hired local women (many of whom had worked in the state's now defunct textile factories) to stitch her couture collections with her. What follows is a step-by-step guide to the stitching, stenciling, and beading techniques used in the 20 projects showcased in the book: T-shirts, skirts, and corsets that are sold at chic shops around the world, plus a journal cover, sampler quilt, and tablecloth, among others. Also included are a pullout stencil, perforated postcard for bead-embroidery, and reusable patterns. Throughout are Robert Rausch's beautiful photographs set against the back roads, farms, and homesteads of the rural South. * "Dixie" is in reference to the $10 notes issued by the Citizens Bank of Louisiana before the Civil War. The notes bore the French word "dix" meaning 10. Eventually some began to refer to the collective southern states as Dixieland.